Hanger steaks are cut from the muscle on the inside of the beef carcass, attached to the last rib, diaphragm and kidney, right below the tenderloin in the plate primal. 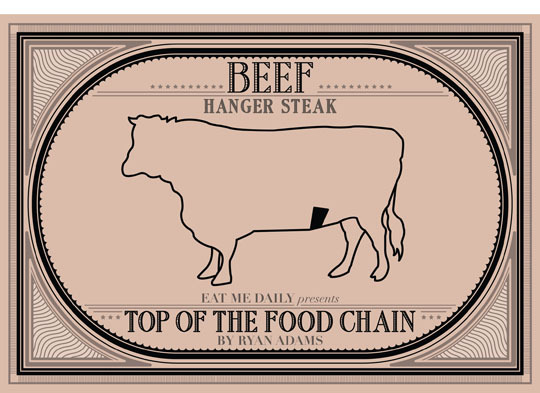 The nature of the location makes it look as though the muscle is actually "hanging" off the diaphragm, and is the source of the steak's name. Its purpose is to support the diaphragm, and that effort tends to make for a surprisingly flavorful cut of meat that can easily be overcooked and made tough. Such close proximity to the kidney also imparts extra flavor as well, with some people saying that hanger steaks exhibit liver-esque flavor profiles. "What I have noticed is that it is not uncommon for a carcass to come back from the slaughter house with the hanger in poor condition. While the rest of the carcass is covered with protective fat and connective tissue, the hanger is mostly exposed rough muscle fiber, which presents a lot of surface area for evaporation and bacterial contamination. I've personally seen hangers spoil in a couple of days just sitting in our cooler. "Another reason why I think they are rare has to do with the fact that hangers are small and are probably tossed into the grinder by butchers/ meat cutters who don't think they are worth the time to trim and package." There is only one muscle in the entire cow that hanger steaks can be cut from, so there isn't any real variation to speak of. The hanger cut consists of two small muscles weighing about eight ounces a piece, joined by a tough elastic membrane. 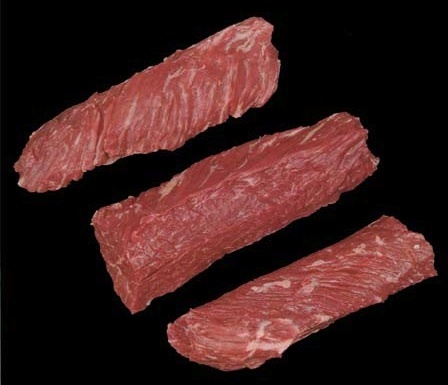 Most butchers will trim the long, V-shaped strip of membrane, forming two portions. There is little fat in this area, so don't expect to find much marbling throughout the grainy muscle. Sadly, it's very unlikely that you're going to find hanger steaks in your local supermarket. High-end markets will be able to order them for you, and dedicated butcher shops might even have them on hand, but call ahead before heading out. 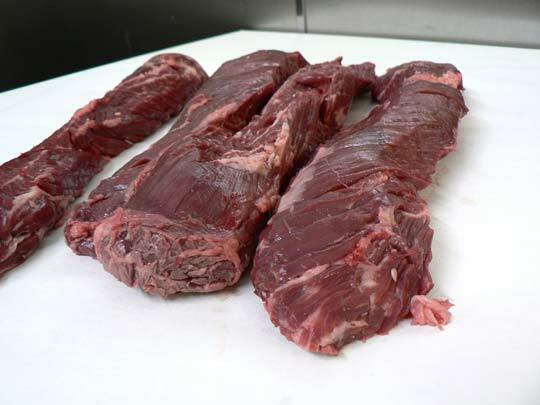 All hanger steaks are trimmed to about the same size and weight. Plan on having six to eight ounces per serving. The meat itself will be slightly darker than other cuts of beef with a small amount of fat running through the meat. Check that the muscle is firm to the touch, and that the container doesn't contain excess liquid. Hanger steaks may be stored in the refrigerator for two days before cooking, possibly three days if you are marinating them. 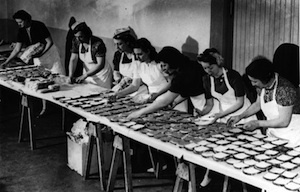 Beef can be frozen in its original packaging for up to two weeks. If you're going for longer storage, you'll want to prevent freezer burn by re-wrapping the steaks in freezer paper, plastic freezer bags or heavy-duty aluminum foil. Try to remove as much air from the packaging as possible before sealing. Because hanger steaks can be rendered tough easily, they should be cooked over high heat quickly, and served rare to medium-rare to ensure that the meat is tender and juicy. Grilling and broiling are excellent methods of preparation, but it's recommended that you also marinate the meat before cooking. Marinating is popular with this kind of cut, as the process imparts extra flavor and moisture while softening the meat without destroying the texture. This recipe comes from David Chang, chef at Momofuku in New York. Combine the apple juice, soy, onion, garlic, sesame oil, and pepper in a large freezer bag (or another container that will snugly accommodate the steaks and marinade) and seal and shake (or stir or whisk) to combine. Add the steaks, seal or cover tightly, and marinate in the refrigerator for 24 hours. Light a good hot fire in your grill. Remove the steaks from the marinade (discard the marinade). Grill for 6 to 10 minutes total for medium-rare, taking care to first char the two flattest sides of the steaks, which should take about 2 minutes per side. Monitor the doneness closely after that—depending on how hot your fire is, they could be cooked in 6 to 8 minutes. When they're ready, remove the steaks to a platter and let them rest for at least 5 minutes. More resting time won't hurt: you can't over rest steak. When ready to serve cut the steaks into ¼ -inch-thick slices, cutting on a slight bias (i.e., your knife at a 15- to 30-angle to the cutting board).